The National Oceanography Centre, Southampton, is hosting a blog from the expedition at IntoTheCaymanAbyss.blogspot.co.uk, which should give a wider account of the voyage, with contributions from multiple team members about their work. Marine science blogger Andrew Thaler (aka Southern Fried Scientist) is aboard and may be posting updates from the expedition. Nearly half of our science team are on Twitter; please see the Team page for links to their IDs. Picture gallery and text about our previous discoveries at the deep-sea vents of the Cayman Trough. Report on our previous expedition in April 2010, which revealed the world's deepest known undersea volcanic vents. 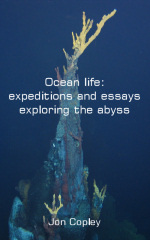 Compilation of personal logs from previous expeditions, and articles about deep-sea vents, by Jon Copley. Research paper presenting details of the geology, geochemistry and biology of deep-sea vents of the Cayman Trough, from data and samples collected during our previous expedition in March-April 2010. The paper is "open access", so no journal subscription is required to read it. Research paper describing a new species of vent shrimp, found at both of the vent fields seen so far in the Cayman Trough. Publication is (c) Cambridge University Press. Research paper describing another new species of shrimp, from the Von Damm Vent Field. Publication is (c) Cambridge University Press. Research paper describing a new species of snail, found at the Von Damm Vent Field. Publication is (c) Cambridge University Press. Find out more about the science behind our expedition, and how school classes of all ages can get involved.